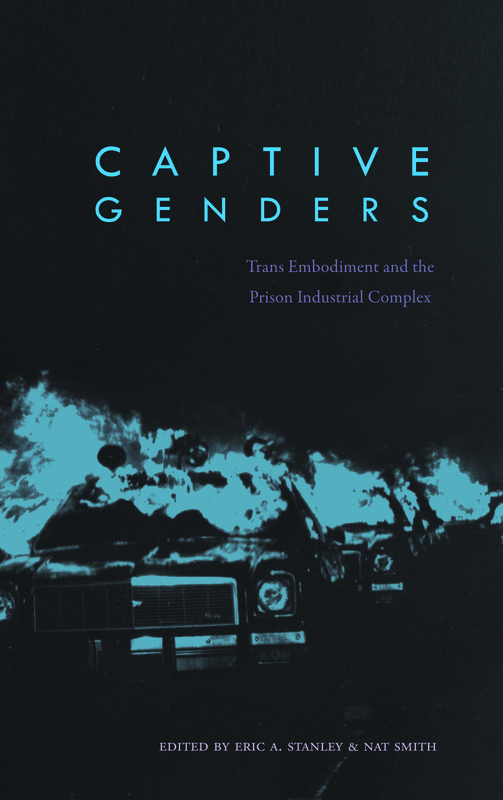 _Join Eric A. Stanley, Ralowe T. Ampu and Toshio Meronek for a book launch and reading of Captive Genders. "new frameworks and new vocabularies that surely will have a transformative impact on the theories and practices of twenty-first century abolition." Books will be available at the reading. We've worked with numerous local spaces which we are grateful for including comrades homes, In Other Words Bookstore, The Variant and PSU. and numerous individuals working in their own capacity. revolutionary community and bring the fight against white supremacy as a strategic intersection to destroying capitalism and patriarchy to the table. Committee to Connect the Dots is excited to be co-sponsoring this important event! 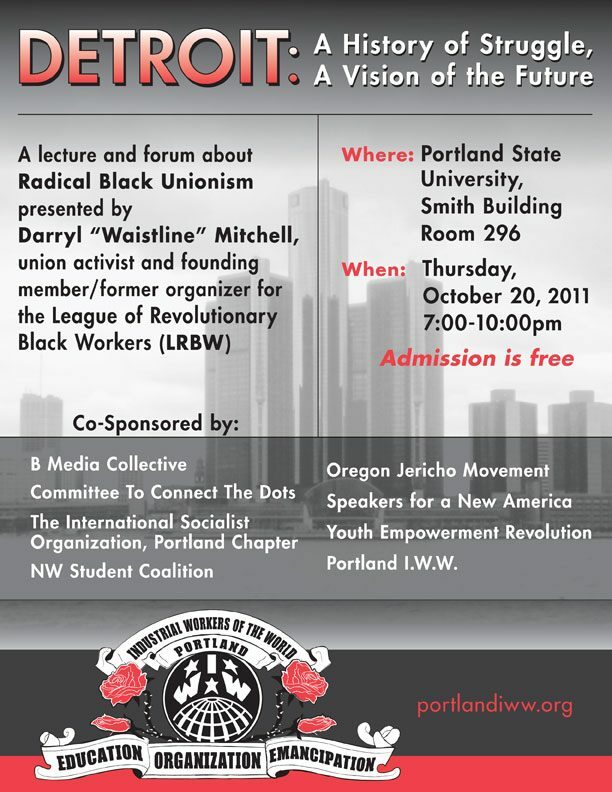 The Portland branch of the Industrial Workers of the World (IWW) will be hosting a lecture and forum on the 20th of October 2011 at Portland State University, Smith Building Room 296, starting at 7pm. This event will be part of a greater North West tour by activist and speaker Darryl Mitchell, a former organizer for the League of Revolutionary Black Workers (LRBW). Darryl Mitchell (Waistline) is a retired Chrysler worker, union activist and former union representative. He is also a former editor of the Southern Advocate and a founding member of the League of Revolutionary Black Workers. Check out some of the following links for information on how you can help, even if by just giving a small donation to support Puerto Rican Political Prisoners. Also check our Revolutionary Culture section for Puerto Rican Independista music and videos. Thanks to everyone who came out to support and remember the legacy of George Jackson. Special thanks to Mark Cook, Kent Ford, Pastor Haynes, and Percy Hampton for speaking. Revolutionary history is an integral part to building revolutionary community. Keep the spirit of our fallen comrades, and living comrades alive. Smash White Supremacy with a revolutionary feminist and queer liberationist praxis to Smash Capitalism and Patriarchy. 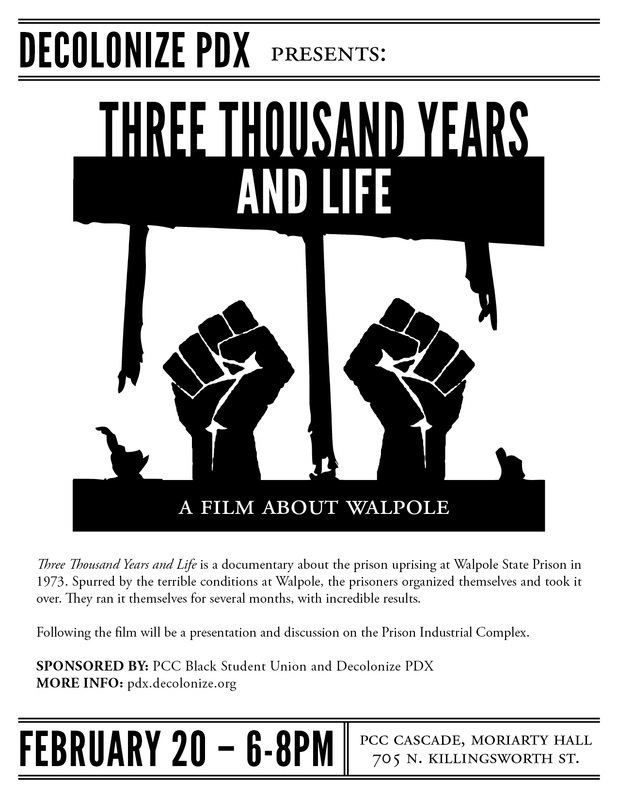 Fire to the Prison Industrial Complex, Fight Police Violence, Free All Political Prisoners and Prisoners of War. See our news/articles section for information on George's legacy and inspiration. Thanks to everyone who came out to the Portland Anarchist Bookfair and participated in our workshop 'Connect the Dots 101: White Supremacy and the Prison Industrial Complex' and visited with us at our table. 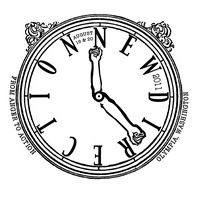 We will be presenting our workshop next at New Directions Fest August 20th. Come out and support us! Build Revolution, Fight White Supremacy, Raze the Walls!!! 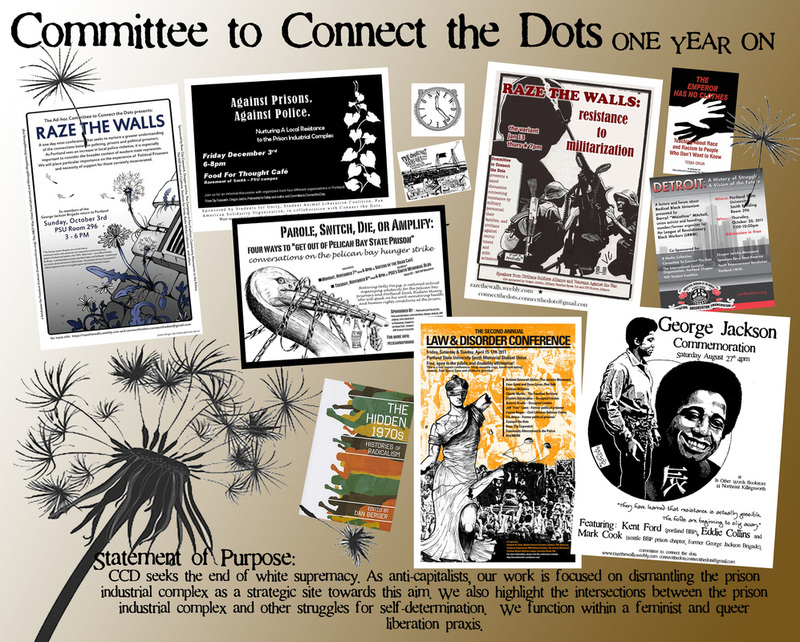 Committee to Connect the Dots is reaching out to University and Community organizations and offering to present our workshop 'Connect the Dots 101: White Supremacy and the Prison Industrial Complex' at events, conferences, meetings and other gatherings in the Pacific Northwest. Please get in touch if interested in hosting us. supremacy, the ways in which the prison industrial complex is central to the maintenance of a white supremacist culture, and finish by working together to connect the dots between multiple struggles. registered nurse who is currently working on her doctorate at OHSU. Her scholarship and community work focuses on mental health, prisons, racism, radical public health and the politics of the body. She has been organizing against prisons, and in support of those in prison, for over 10 years and is currently a member of The Committee to Connect the Dots, a local organization working to end white supremacy, with an emphasis on destroying the prison industrial complex. C.C.D. would like to thank Dan Berger for attending our ongoing Off The Pigs! spring mixer and for sharing important critical insight on revolutionary history and strategy in the United States. Description from website: "The 1970s were a complex, multilayered, and critical part of a long era of profound societal change and an essential component of the decade before—several of the most iconic events of “the sixties” occurred in the ten years that followed. The Hidden 1970s explores the distinctiveness of those years, a time when radicals tried to change the world as the world changed around them. This powerful collection is a compelling assessment of left-wing social movements in a period many have described as dominated by conservatism or confusion. Scholars examine critical and largely buried legacies of the 1970s. The decade of Nixon’s fall and Reagan’s rise also saw widespread indigenous militancy, prisoner uprisings, transnational campaigns for self-determination, pacifism, and queer theories of play as political action. 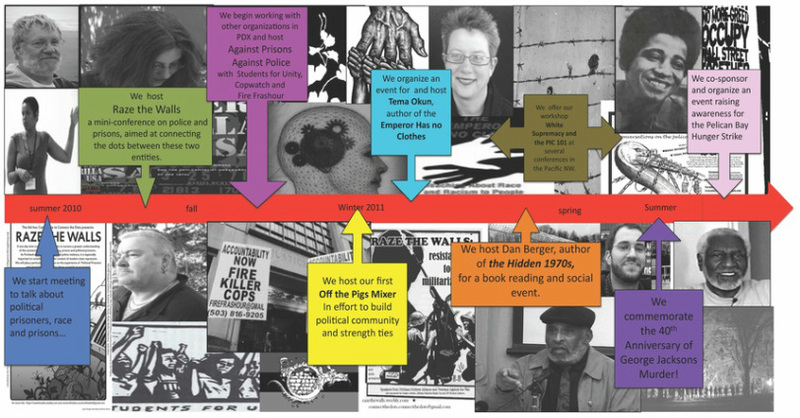 Contributors focus on diverse topics, including the internationalization of Black Power and Native sovereignty, organizing for Puerto Rican independence among Latinos and whites, and women’s self-defense. Essays and ideas trace the roots of struggles from the 1960s through the 1970s, providing fascinating insight into the myriad ways that radical social movements shaped American political culture in the 1970s and the many ways they continue to do so today." You can order copies HERE or come see the Connect the Dots table at a local event, we have some on hand for sale. Click on conference titles to go to their respective pages! The 2nd International Copwatch Conference will take place in Winnipeg, Manitoba, Canada on July 22, 23 and 24 of 2011. The conference will include sessions of panel discussions, workshops, and video screenings that focus on particular aspects of policing. Some topics to be included are policing in the context of colonialism; policing and immigration; policing as a gendered, classist and racialized practice; the fluidity of defining crime and criminality; the politics of accountability; community alternatives to policing and practice of restorative justice models, and a range of other topics. 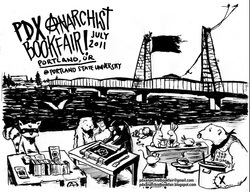 The 2011 Portland Anarchist Bookfair is happening on July 23rd and 24th at Portland State University. It will be hosted by Students for Unity and be completely free. If you are interested in hosting a workshop, being a vendor, or volunteering please e-mail us at pdxanarchistbookfair@gmail.com. More Details to come! massive scale; the mass incarceration and discrimination against “non-citizens”; and the continual centralization of wealth and means of human livelihood in the hands of a small but powerful class of people. The point is not to paint a picture of a hopeless situation in which everything is falling apart and the world is ending because of some supposed inherent evil of human kind. The point is it’s increasingly obvious that the flawed systems which these problems stem from are no longer tolerable: capitalism, industrialism, representative politics, all forms of oppression. As all these various crises converge we are told we can look to our political systems for solutions, or ought to lose ourselves in some spectacular new product or substance. These answers are not going to prevent us from feeling the effects of these mounting issues. The mounting crises prompt a need for immediate radical change in the direction of a more equitable, democratic, and free society. The lessons of history indicate that such an effort cannot be accomplished successfully as isolated cases within individual countries. The current situation requires the mobilization of afflicted people working together on a global scale for radical change. August 20, 21 2011 @ the Vera Project We’re excited at the opportunity for the third year in a row to continue to play a role in pushing the Seattle anarchist milieu into a forward momentum, creating more opportunities to communicate face to face. We find each other in intentional spaces created to contain our love, misery, joy and fierceness. Let’s continue to make the distances between us smaller; let’s continue to create intentional anarchist spaces. We are now accepting tabling applications and workshop proposals for the 2011 Book Fair! The Denver Anarchist Black Cross would like to formally invite you to a conference for North American Anarchist Black Cross chapters from August 12-14, 2011 in Denver. This is an invitation to attend this conference. Also seeking proposals for workshops, skill shares, or other activities that chapters would like to see at the conference. Committee to Connect the Dots would like to thank all the organizers and participants of both the Counter-Counterinsurgency Convergence, and the Law and Disorder Conference! Our workshop Connect the Dots 101: White Supremacy and the Prison Industrial Complex and our literature tables were well received at both! Please contact us if you participated or met us and have any further questions! Stay tuned for upcoming events we have in the works, or if you would like us to bring our workshop to your school, community, town! About the book: The Emperor Has No Clothes: Teaching About Race and Racism to People Who Don't Want to Know The book offers theoretical grounding and practical approaches for leaders and teachers interested in effectively addressing racism and other oppressive constructs. The book draws both on the author's extensive experience teaching about race and racism in classroom and community settings and from the theory and practice of a wide range of educators, activists, and researchers committed to social justice. About the author: Tema Okun has spent many years working for and in the social justice movement. An experienced teacher, she facilitates anti-racism, anti-oppression work as a member of the DRworks collaborative. She is an Assistant Professor in the Educational Leadership Department at National Louis University in Chicago and is also active in Middle East peace and justice work with the Israeli Committee Against House Demolitions-USA.The book will sell for $25 at the talk and reading. For more information about the book, the author, and the work,go to www.dismantlingracism.org. Þ Lily Hughes is an organizer and co-founder of the Civilan Soldier Alliance-- an ally organization that supports service members working for their rights and against the occupations. Þ Sarah Lazare is a member of the Civilian-Soldier Alliance and Courage to Resist, organizations that support GI resistance and anti-war movements from within the ranks of the military. Þ Scott Kimball is an Iraq veteran and member of Iraq Veterans Against the War. He is a core organizer of the Central Illinois IVAW chapter. Þ LT is an organizer with Civilian Soldier Alliance and a member of Military Families Speak Out. She recently finished volunteering with the Rural Organizing Project on the No Soy El Army tour in rural Oregon, and is actively working to support Coffee Strong, a GI rights coffee shop, outsideof Ft. Lewis in Lakewood, WA. Check out our links section HERE for more information on participating organizations. Please check our links for more information on organizations involved! The Ad Hoc Committee to Connect the Dots presents a mini-conference that seeks to nurture a greater understanding of the connections between policing, prisons and political prisoners. 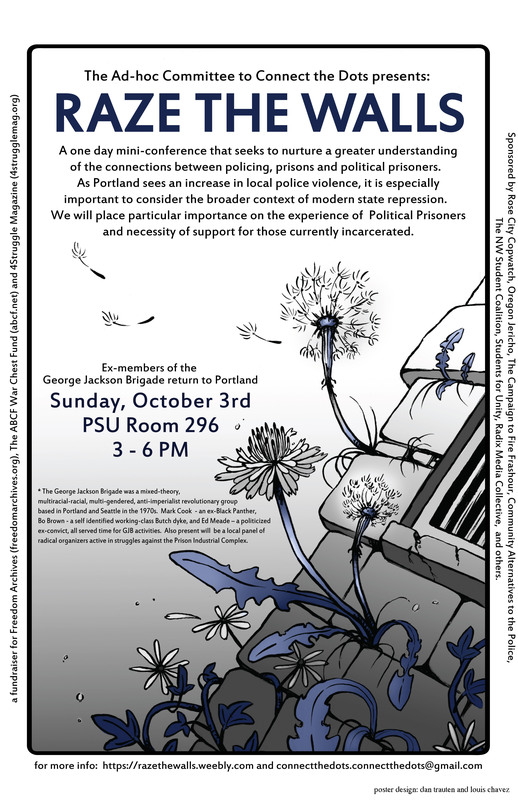 As Portland sees an increase in local police violence, it is especially important to consider the broader context of modern state repression. We will place particular importance on the experience of Political Prisoners and necessity of support for those currently incarcerated. Rita “Bo” Brown, an ex-George Jackson Brigade Member and ex-political prisoner. Bo identifies as a working-class, butch dyke and has been active in the prison abolition movement since her release from prison in 1987. After her release she started The Out of Control: Lesbian Committee to Support Women Political Prisoners, which remained active for many years. Ed Meade, an ex-George Jackson Brigade member and ex-pollitical prisoner who is currently the editor of Prison Art News and an active member of Seattle Jericho. Mark Cook, prisoner support activist, active member of Seattle Jericho, former member of the Black Panther Party and George Jackson Brigade. Caylor Rolling, a Portland local, who has been active in prison related advocacy projects since 1996. She currently works for a non-profit where she educates the community about incarceration and its costs and organizes to stop prison construction and the growth of Oregon’s prison budget.